Carving clean GS turns has been the ultimate goal of racers and coaches alike for at list two decades. It is a common knowledge that in order to carve, racer needs to place the ski on edge by executing a succession of technical elements generally described as edging. Although it is also not a secret that edging could be performed by the combination of ankle, knee and hip angulation, and by inclination, what produces the best GS turn has been somewhat unclear. When to use the above elements and in what combination? Which technique is the most efficient and ultimately the fastest? I will attempt answer some of these questions by focusing on one of the key elements: inclination. Inclination is a deviation of the skiers body from its vertical axis. In simple terms it is a movement of the entire body forward and inward in the direction of the center of the future turn as illustrated by this photo. So how is inclination different from «banking» or simply «leaning in» (both of which are considered a gross technical error)? There is a fine line between the two that really makes a significant difference. While inclining, racer keeps his hips and shoulders level. Hips stay almost square to the skis in the beginning of the turn and progressively «open up» into the fall line helping to maintain an edge grip. Ski edge angle is created primarily by extended outside leg with minimal or no knee angulation. A small amount of tipping with the shoulders could result in putting extra weight on the inside ski and skidding the turn. A little too much inclination or doing it too abruptly would result in falling to the inside of the turn. Inclination performed with the right timing and precision is an art that takes years to master. 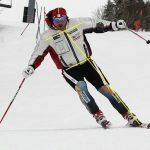 In order to understand why it has come about and became one of the important parts of modern giant slalom technique we need to take a close look at basics of this discipline. Giant Slalom at any level is about speed. There are number of factors affecting the overall speed in the course. Many racers and coaches have been pondering the question of what generates the most speed. 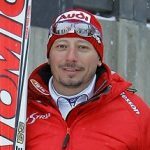 I take a very basic approach to ski racing and study racer’s speed in the course as a result of the interaction between two key factors:-line of the descent carve of the ski. One may wonder how does racer’s speed depend on these key factors. The answer is simple: a racer who can carve turns most cleanly while holding the tightest line throughout the course will have the most overall speed. 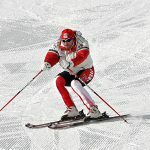 Therefore, all the technical elements of giant slalom, including edging techniques, should be geared toward the efficient line of descent and carving. Physics of the process are also simple — a racer carving turns on the tightest line possible delivers his center of mass through the straighter more direct path from start to finish. Although that alone produces significant time gains, there are other advantages of inclination. To fully understand them we need to look more into the physics of the turn. We are looking here at a hypothetical situation: to create the edge angle alpha, racer A uses mostly knee/ankle angulation while racer B creates the same edge angle a by inclination with extended outside leg. 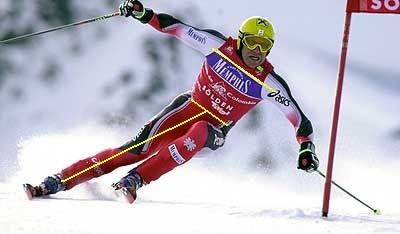 Even though the edge angles created in both cases are equal, the distances to which the skis are displaced from under the center of mass are different. It is obvious that Rb > Ra. Now let’s review the following empirical formula: (E) = M x R translated into words it means the following: the energy E that skier gets out of the turn equals the product of momentum of inertia (M) and speed of the turn radius (R), in other words for the same given mass the farther away the parts of this mass are displaced from the turn axis the greater the turn Energy produced will be. 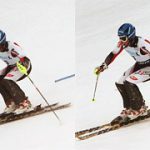 Therefore racer B from the above picture will produce more energy by inclining and displacing his skis farther from under the body then racer A showing smaller displacement by using knee/ankle angulation. In most skiing situations higher edge angle provides for a better edge grip. Too much edging in the initial stage of the turn would result in the early «edge lock»which is slow. Properly performed inclination allows a racer to achieve higher degree of edging progressively throughout first half of a turn without locking the edge prematurely and slowing down. All the above benefits of inclination only come into play with proper execution. What does it take to incline effectively and what other technical elements are involved? Pole plant provides for initiation of extension as well as assists in consequent propelling of the center of mass forward and inward in the direction of the center of a future turn. Extension is referred primarily to the extending of the new outside leg which was bent at the completion of the previous turn. While legs are extended, neither hip nor knee joint are «locked» as demonstrated by Michael Von Grunigen and Fredrik Nyberg below. Extended outside leg is essential for proper inclination and displacement as illustrated in pictures above. Extension/Projection provides for a smooth flow of CM. It could also be described as cross-over (CM crosses over the skis) or cross-under (skis cross under the body). 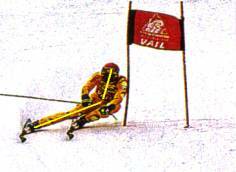 In modern «arc to arc» GS skiing both types of cross movements take place almost at the same time. For the sake of separating the two we can say that in the rounder turns on steep sections cross-over takes a prevalent part, while in the straighter flat sections cross-under is more defined. Referred to «break at the hip» in a second part of the turn as demonstrated here by Michael Von Grunigen. Often considered an edging movement, angulation in reality just compliments inclination. It serves for maintaining an edge grip when forces build up in a second part of a turn. Angulation cannot be performed effectively unless the initial edge angle is created by inclination with extended leg and level shoulders. For a powerful turn exit it is important that outside leg stays extended until after the arc is completed. Then it relaxes and bends slightly only to provide for a new extension/ projection movement (normally initiated by a pole plant). These movements in turn provide for inclination followed by angulation. In other words, the whole technical cycle happens once again and again and again throughout the entire GS course.